People have been asking all around town what was going on along Nir Shreibman Blvd. from near Murfreesboro Rd. to the roundabout on Stones River Rd. Many years ago the city was awarded a grant to build a greenway, but had to match part of the costs. Then a few years ago, the former mayor said she would not sign off on the grant before seeing what it had been used for first. That was a pivotal moment in the development of the greenway because a big “uh oh” came from the state when it realized the money had not been spent. Zoom ahead to today and you can see the work being done to build the greenway. If my memory serves me, the hope is to eventually connect it to the old road bed and create a true walking path through the woods and to the lake. There was not adequate funding to build restroom facilities, but there will be a parking lot and probably some benches and resting areas along the greenway. I reminded the city earlier this week that we had purchased three swing benches for the new playground for adults to sit in while watching their children play. (The state strongly suggested they not be installed because not enough padding was surrounding it. I thought that was absurd at the time and still do.) One of the benches has been installed at the Senior Center, but that should leave a couple at least to use for the greenway. 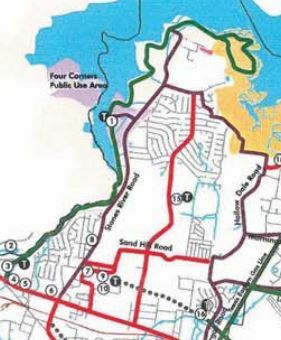 Here’s a link to the Master Greenway Plan for La Vergne and Smyrna from years ago. If you zoom in, you can see where the greenway is designed to eventually go (it’s the green line at the top left hand side of the map area on Page 4 as pictured above). The big question… when will it be done? May of 2017. So there you have it. This will be a nice addition to help with the quality of life here in La Vergne and I truly appreciate the effort put forth by everyone involved in the project! "Patience, Grasshopper: Greenway Completion Still Months Away", 5 out of 5 based on 4 ratings.